Northern whites in the post–World War II era began to support the principle of civil rights, so why did many of them continue to oppose racial integration in their communities? Challenging conventional wisdom about the growth, prosperity, and racial exclusivity of American suburbs, David M. P. Freund argues that previous attempts to answer this question have overlooked a change in the racial thinking of whites and the role of suburban politics in effecting this change. In Colored Property, he shows how federal intervention spurred a dramatic shift in the language and logic of residential exclusion—away from invocations of a mythical racial hierarchy and toward talk of markets, property, and citizenship. Freund begins his exploration by tracing the emergence of a powerful public-private alliance that facilitated postwar suburban growth across the nation with federal programs that significantly favored whites. Then, showing how this national story played out in metropolitan Detroit, he visits zoning board and city council meetings, details the efforts of neighborhood “property improvement” associations, and reconstructs battles over race and housing to demonstrate how whites learned to view discrimination not as an act of racism but as a legitimate response to the needs of the market. Illuminating government’s powerful yet still-hidden role in the segregation of U.S. cities, Colored Property presents a dramatic new vision of metropolitan growth, segregation, and white identity in modern America. "With evidence drawn from a variety of disciplines, Freund raises the standard for urban studies. . . . The successful balance among the individual decisions, racial bias, and economic policy that Freund achieves embodies the ideals of historical analysis. . . . 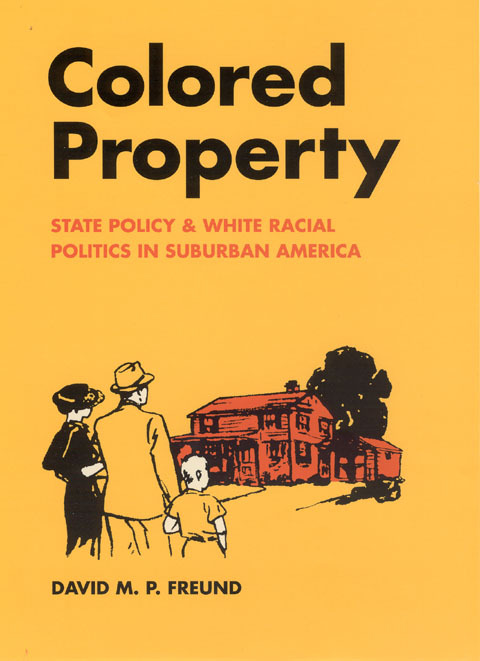 Colored Property is crucial reading for historians and educators studying the recent past of the metropolitan Midwest. It is also an invaluable work for researchers interested in the expansion of American suburbs in the twentieth century." "Freund has produced an important book and one likely to become required reading for all students of urban history and federal public policy." "[Freund’s book] unravels the ties that bound (and bind) race and property, and, in the process, shows how that linkage altered white racial ideals and politics in postwar America." "Every historian of twentieth-century United States will certainly have to reckon with Colored Property. The study paves the way for new understandings of everything from the evolution of white racial ideology and federal policy after 1910, to the ways in which the politics of race shaped the postwar Democratic Party, to the reasons why the Detroit metropolitan area today has the highest segregation index in the country. That is no small accomplishment." "Beware! Colored Property might very well outrage some readers. Whether or not it does . . . it deserves a key place in the historical and sociological scholarship of metropolitan America. . . . Unquestionably Colored Property is a most compelling volume to read and to contemplate. Its scholarship is prodigious. Its findings are searing. Surely this book is destined to exert enduring influence. It is required reading for a multiplicity of audiences, including historians, social scientists, legal scholars, journalists and policy makers."